Companies in Russia and the UK are enjoying the lowest corporation taxes (accounting for just a fifth of their profits) of the major global economies included in a new study by UHY, a leading international accounting and consultancy network. According to UHY, Russia’s headline corporation tax rate was 20% on taxable profits of USD 1,000,000 for the financial year ending 2015*, while in the UK the rate was 21%. Both are far lower than the global average corporation tax rate of 27%. For BRICs economies the average is 27.9% and the G7 average is even higher at 32.3%. UHY explains that low corporation taxes can help countries create economic advantage and fuel growth by freeing up more capital to encourage company investment and attracting foreign companies to locate there. UHY points out that in the UK, the headline rate was cut by 3% from 24% the previous year**, and is set to decrease further, from 20% in 2015/16 to 18% by 2020, as the government seeks to bolster the economic recovery and create a more company-friendly environment. Russia’s corporation tax regime compares very favourably with other BRICs economies. It is five percentage points lower than in China (which charges 25%) and 13 percentage points lower than India and Brazil (where rates are 33.1% and 33.7% respectively). UHY says that for Russia, maintaining a competitive rate is especially vital, as economic sanctions and geo-political tensions have made it increasingly challenging for it to attract foreign investment. UHY tax professionals studied corporation tax data on taxable profits of USD1,000,000 in 31 countries across its international network, including all members of the G7, as well as key emerging economies. The USA is at the top of the table of economies with the highest corporation tax in the study, charging a headline rate of 41.1%. However, UHY points out that this is in fact mitigated by a variety of schemes and deductions which result in many companies’ effective tax rate being far lower. Japan is also in the top three, despite reducing corporation tax by 2.5% in a year as part of Prime Minister Shinzo Abe’s “Abenomics” policy to stimulate growth in the Japanese economy following more than two decades of stagnation. Interestingly Malta has the fourth highest (tied with Argentina) corporation tax in the study. However, UHY points out that Malta credits any income tax paid by a company to the shareholders when profits are distributed. This credit along with a system of refunds reduces the effective tax rate far below the headline 35% rate. UHY says that of the 31 countries in the study, most (74%) have kept corporation tax rates the same over the last two years. 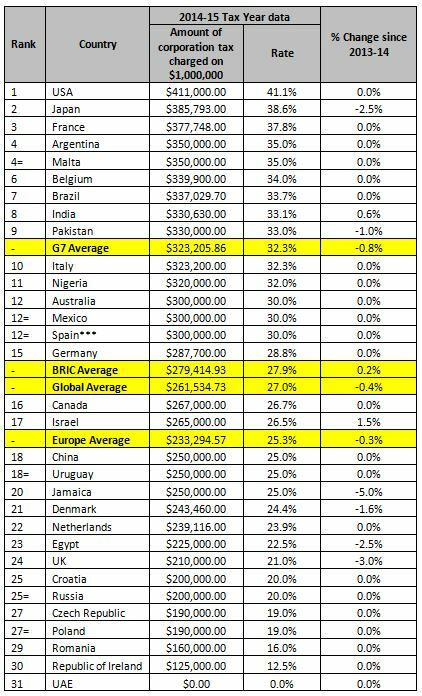 Six (19%) lowered rates last year, while just two countries (Israel and India) raised it (see table below). UHY adds that the UAE has the lowest corporate taxes of any country in the study – charging no corporation tax at all - followed by Ireland (12.5%) and several eastern European countries including Romania, the Czech Republic and Croatia.